“Choice! 2011” is finish soon! 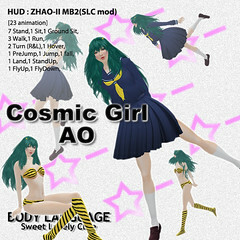 are you get “Cosmic Girl AO”? This AO was created in the image of an active and cheerful girl. Please try them out on the animation vendors wearing casual clothes. I think you will really enjoy the lighthearted actions in it. Please come and visit my main store.